Tony Rizzo with a Wisconsin giant. Famous northwoods guide Tony Rizzo of Star Lake, Wisconsin, died Tuesday, September 18. Rizzo, age 83, a 62-year resident of Star Lake, passed away at the Friendly Village Nursing Home in Rhinelander, Wisconsin. 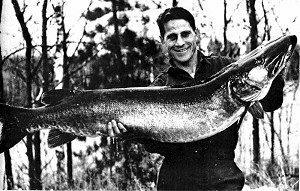 Rizzo owned and operated the Silver Musky resort in Star Lake and was a musky guide in the area for over 60 years. During his career as a guide he boated over 4,000 muskies and caught many line class record fish. Rizzo was inducted into the National Fresh Water Fishing Hall of Fame. He wrote eight books and hundreds of articles for fishing/outdoor magazines, and developed a number of musky baits, most notably the Rizzo Wiz. “I am saddened by Tony’s death. Not only did we lose a gentleman and a great fisherman, but part of the northwoods died, too. Tony was one of the few remaining links to the old guides and traditions, when a northwoods vacation meant piling the family into the car for a long drive to your cabin and spending the week fishing,” said Musky Hunter Managing Editor Steve Heiting. Rizzo was born on August 13, 1935 in Chicago to Salvatore and Josephine Rizzo. He was preceded in death by his wife, Delmalee Rizzo, in 2013; his parents; and his brother, Vito Rizzo. Tony is survived by his son, Tony (Katy) Rizzo of Minocqua, Wisconsin; four grandchildren, and special friend, Rosemary Renhack of Conover, Wisconsin. Graveside services were already held. Online condolences may be expressed at gaffney-busha.com.